Thousands of landless villagers in Maharashtra's Marathwada region are forced to take up sugarcane harvesting for lack of better livelihood alternatives. Shirish Khare visits the region and uncovers the rampant exploitation and hardships for workers that these contracts entail. I am reminded of the old poem from my school days, Shikari aata hai, jaal failata hai. Daane ka lobh dikhata hai, lekin hamein jaal mein nahï fasna chahiye (the hunter comes and lays a trap, lures us with food, but we must not fall into the trap). The words take on a whole new meaning in Marathwada, as I listen to tales of the predator and the prey here. 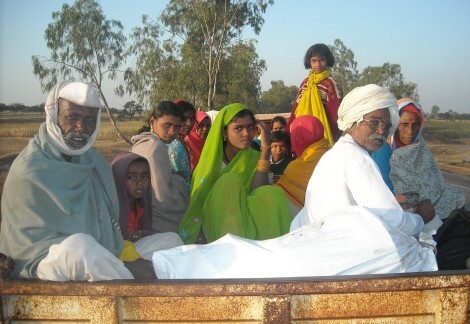 The morning after I reach there, I catch sight of a tractor carrying about a dozen sugarcane cutters and their families. They carry with them their entire world: food, clothes and other bare essentials for survival. Children lie asleep on their mothers' laps or sisters' shoulders, huddled together with the cattle. When I ask them where they are going, one of the women say, "Very far ... to Karnataka ... Bidar factory". And when will they be back? "Not until the rains", comes the reply. In Marathwada, many such tractors ply on the roads connecting the villages to the cities. Most villages in Kalamb Tehsil, about 100 km away from Usmanabad, lie dreary and deserted. This area is known particularly for sugar production. Government statistics puts the number of sugar factories here at 30, out of which seven are in Usmanabad district alone. Out of these again, four more are in Kalamb tehsil. The Terna sugar factory, the first ever factory here, was set up at Dhonka in Usmanabad in 1982. A member of the Terna Sugar Factory Committee, on condition of anonymity, reveals "Every factory here needs sugarcane worth 25-50 kms of land which is taken care of by supervisors. The supervisor signs a deal with the Factory Committee for Rs. 5-10 lakh in exchange for which he assures the toils of 12-20 labourer pairs for 6 to 10 months." A social worker working in that area, Bajrang Tate informed us, "Supervisors belong to the upper castes here. They persuade labourers and their wives to work for 6 to 10 months for a measly Rs. 25,000-30,000. They make a legal agreement with the labourers . sometimes for factories in far off areas. Under these agreements, labourers from here go to work in areas as far as Pune, Kolhapur in Maharashtra and Bidar, Alumathi and Bedgaon in Karnataka while labourers from those areas come here to work." Living on the outskirts of the villages here, these labourers remain untouched by Gram Panchayat schemes and plans. The sugarcane farms they work in are replete with tales of exploitation. Thousands of labourers leave their homes here every year between Diwali and the monsoons to work as sugarcane cutters for the sugar factories. Most of them belong to Dalit, Banjara and Pardi communities. Vinayak Taur, an educated Dalit youth from the nearby Massa village tells us, "Thousands of labourers leave their homes here every year between Diwali and the monsoons to work as sugarcane cutters for the sugar factories. Most of them belong to Dalit, Banjara and Pardi communities. They neither have any land they can call their own nor any other source of livelihood. School-going children here are the worst hit by the migration"
According to Balaji Mulay of Kalamb, "The supervisors do not get much time to gather labourers for work available in these factories. So they make sure they use their labour to the fullest without any compromise. This creates exploitative scenarios of the kind narrated by Maya Shinde of neighboring Dorala village. Shinde talks of Bharat Sontake, who never thought that he would be inflicted by TB soon after signing a deal with one of the supervisors for a six-month contract in Kolhapur for Rs. 20,000. The supervisor, after hearing of Bharat's disease, forced Bharat's entire family . his wife, ageing parents and young daughters - to work to compensate for his absence." Visiting the factories around Kalamb, it is easy to notice a cluster of huts around the plants. These are make-shift homes for the labourers over the initial 15-20 days of work. After that, they will be split up into smaller groups and sent to their respective factories for work. One such Basti near Dharashiv sugar factory in Khedki village that I visited is made up of 12 huts . rickety structures barely standing on sticks and rags. The huts have just one room for the whole family with just about enough space to stretch one's legs. Children and women have to walk miles for water; electricity and basic sanitation remain a distant dream in these bastis. At the break of dawn, labourers leave home with little more than a scythe made specially to cut sugarcane. They work on the sugarcane farms in pairs: one cuts sugarcane while the other gathers it in a bunch. A pair usually cuts about 2 tonne of sugarcane everyday which is then transported to sugar factories. Trucks carry sugarcane to the factories well into the night. Often, children also work as labourers on these farms, alongside their parents. Many children cook and clean at home while their parents toil on the farms. Ishara Gore, one of many such child labourers here says she studied in the 3rd Standard and will be going to the 4th when the family returns to their village. Little does she know that her school exams would be over by the time she returned. Ishara's family has migrated to Karat village in Sagli district for work. Her father, Yavik Gore tells me, "It's good if she studies, otherwise we will have to get her married in the next five years anyway. Then she will work with her husband "
Child marriage is a common practice here; the nature of employment and resultant migration perpetuate the malaise. Marriage often takes place within the labourers' families so as to increase the number of labourers and hence family income. Shobhayani Kasbe, who works at the neighbouring Shambhu Maharaj sugar factory, voices her concerns about her children, "Our children work when they should be playing and studying. Sometimes, they seem very irritable while sometimes they recoil into a shell and become very quiet." When asked why they do not take them back home sometimes, Mudrika Gore says, "We are not allowed to go back home before the contract ends, except during elections. We are taken back only to cast our vote during elections and brought back here soon after that." All sugarcane cutters have stories of gross exploitation to tell: stories of being overworked and underpaid, of being battered mercilessly by the supervisors if they even so much as dared to raise their voice. Shivaji Waghmare of Wabhal village narrates one of many such incidents, "Last year saw very good production of sugarcane for which the labourers had to pay a price. They were forced to work even after their contract had ended. When some labourers protested, they, along with their wives and children, were beaten up ruthlessly. But what alternatives do the hapless villagers have? The Rural Employment Guarantee Scheme run by the Maharashtra government here is more of a farce than anything else. We visited the Vikaskhand Kalamb office to uncover the truth behind this government scheme and were appalled by what we discovered. Basant Waghmare, the Development Officer of the Panchayat department told us, "It's been a year since the scheme has been implemented but there are employment opportunities in only seven out of the 89 villages in this block. With over 50,000 labourers in this block, only 2500 have got jobs under this scheme. And even among those who have managed to get jobs, many are yet to be paid. They will be paid only after we receive a grant of Rs 500,000 from the district authorities." He pointed out that the scheme was mired in red tapism, which is why it remains defunct at the implementation level. Social activist Tate, however, unravels the other side of the story, which is quite contrary to what meets the eye. He says, "Gram Panchayats here are dominated by the land-owning upper castes. They need labourers to work on their land. Labourers are thus kept in the dark about the government employment scheme just so they continue to work in farms under oppressive conditions. This way, the status quo remains undisturbed and the power equation unperturbed."